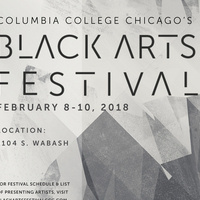 The 2018 Black Arts Festival at Columbia College Chicago is an affirming community space for Columbia students and faculty who identify within the African Diaspora to share work (film, music, dance, design, fine art, spoken word, academic papers, etc.) and critically engage with each other through roundtable discussions, audience interaction, and collaboration. The Festival is the first event of it's kind since 1968, and is curated entirely by Black students and alumni. Read Columbia's story on the Black Arts Festival.